The 1939 24 Hours of Le Mans was, at the time, considered one of the greatest races ever run. Which was appropriate since it represented the end of an era. For Bugatti, for the race, for Grand Prix racing in general, for France, and the whole world even. It would be the last Le Mans for a decade, and the last for Bugatti for nearly six more. The race was won by this car, the Bugatti Type 57C “Tank” #1. It was the last in a line of Bugattis nicknamed “Tank,” and it was driven by two legends, Jean-Pierre Wimille and Pierre Veyron. The nickname was for the streamlined body which was strikingly weird in an era of outboard open-wheeled cars. It was powered by Bugatti’s supercharged straight eight that by this time was making around 220 horsepower, but was getting long in the tooth. Ettore Bugatti wasn’t really interested in entering a car in Le Mans that year having won the race two years earlier with Wimille also behind the wheel. Ettore had proved his cars were the best in the world and had shut down his racing program. He also probably knew winning was a longshot as the Bugatti wouldn’t be the fastest car in the race like it most certainly was in ‘37 (due mostly to the fact that France had changed the race to sports car rules in 1936 to keep the dominating Germans away). But, Ettore’s son, Jean, managed to convince his father to let him build a car for the race. “Just one,” he was told. Since only one car could win, only one Bugatti was needed. Jean Bugatti penned the body, an update to his Tank from two years prior, this time in aluminum and weighing only 60kg. Unlike the earlier car, this one was fitted with a Rootes supercharger, and ran on a normal 57S touring chassis. It would be up against six Talbots, eight Delahayes, two 3 liter Delages, two V12 Super Lagondas, and an Alfa 2500SS, the only Italian car to run in France that year. Jean-Pierre Wimille was one of the most interesting characters in a century filled with interesting characters. I wrote an epic post all about him a couple years ago if you’re interested in the full story. Long story short, Wimille was the son of an early auto journalist, so grew up around cars and racing. But, he decided he wanted to see the world, so he joined the Merchant Navy. He ended up as a staff driver in Morocco during the Rif War where he was able to drive fast cars owned by a Sultan around the desert. This gave him a love of speed, so when he got home, he bought a Bugatti 37A and started racing. He got a reputation as an erratic driver and survived some intense crashes before he learned to settle down. When he was eventually hired as a Bugatti works driver, he stopped losing races and became the best driver in Europe. During WWII, he married a famous ski racer then joined the French Resistance where he would drive an old Bugatti factory truck filled with weapons to hide them from the Nazis. One day, after his Resistance cell was sold out to the Gestapo, Jean-Pierre barely escaped capture by diving through a chateau’s glass window and into a river only to watch his paralyzed with fear wife get arrested and taken to a concentration camp. She would later escape with the help of her cousin, a Red Cross worker, but for several weeks, Wimille was sure his wife was dead. They would both survive the war, but many of their Resistance comrades, including Jean-Pierre’s co-driver from the ‘37 Le Mans, the great Robert Benoist, would not. After the war, Wimille would continue racing, start his own car company, become Juan-Manuel Fangio’s mentor, and continue being awesome until his tragic death during a practice run in Argentina in 1949. Veyron, on the other hand, was never really considered a top driver when he took the wheel with Wimille. Trained as an engineer, he didn’t start racing until he was 27. Most of his success came in 1500cc voiturettes. He became a Bugatti voiturette works driver in 1933 with his most famous victory happening at AVUS in Berlin in front of a newly elected Adolf Hitler who was so incensed he ordered the formation of a German GP program. Veyron would switch to private owned Grand Prix cars himself in 1934 and would finish 6th at Le Mans in 1936 with the British co-driver W. Williams. The race, like I said, was apparently a thriller. But, things started awfully for the Bugatti team. A couple days ahead of the start, their engine completely demolished itself on the second practice run. 8 new pistons were rushed to the race from Alsace on a Bugatti Autorail. And, with the help of a local metal shop, the block was honed and put back together just in the nick of time. But, there was only time for a quick test before the start and that didn’t go well. After the hurried rebuild, things were not quite right, and Jean Bugatti thought the odds were against finishing. Winning would take a miracle. Some tweaking, though, seems to have made things better as the Bugatti sprinted into third after a good start behind a Lagonda and a Darracq. The top two cars alternated between the Darracq, a Delahaye, and a Delage; but Wimille kept the Tank comfortably in third over the first few laps. At one point, the mighty Delage’s driver, Robert Mazaud decided enough was enough, and began pulling away, setting a track record of 5 minutes 12.1 seconds, besting Benoist’s record from two years earlier by a full second. The Delage didn’t have a blower which makes the feat all the more impressive. Luigi Chinetti in his Darrocq fought back and the ensuing speed battle meant the Bugatti slipped even further behind, 1 lap down in 4th after the first 6 hours. It had, however, managed the third fastest lap, a 5.31 averaging 90.4 m.p.h., a good sign. At night, one of Jean Bugatti’s clever add-ons proved its worth. A special light attached to the driver’s side that illuminated curbs, and sharp turns before the headlamps. At 2 o’clock on the second day, a Delahaye now in second caught fire. Wimille and Veyron were now back in third, still a lap down to the Delage, but so was the Darracq that had taken over second. Its time was limited, though, and soon the Darrocq was also out of the race after it lost a tire and spun out into a sand pit. After a broken wheel caused Veyron to limp the Bugatti back to the pits, Louis Gérard was left all alone in the Delage. The lone Alfa made a run at the front, but had to drop out due to some kind of mechanical trouble since Alfa will be Alfa. The Bugatti had more issues, this time with overheating. Removing the inside wings helped, but they had lost a second lap to the Delage. With its lead safe, Gérard brought the Delage in to have its plugs changed. Wimille had the Bugatti trimming about 3 seconds a lap off the Delage’s lead, but, at two laps down, this would never be enough to take over first place. This day, however, a miracle would appear in the form of apparently bad spark plugs. As soon as the Delage was back on the track, the engine began to misfire. The Bugatti got one of its laps back. The Delage stalled out. It now had two broken valve springs. Gérard managed to get it going again, but it was still misfiring and, with just a couple hours left, Wimille gained another lap. The Delage no longer had time to pit for repairs. It began to look pretty dodgy. With one hour left, the big blue Tank roared past the nearly stationary Delage on the Mulsanne Straight to take the lead. They would finish 4 laps ahead, covering 248 laps and beating Wimille and Benoist’s 1937 record run by nearly 67 kilometers. A Bugatti wouldn’t race again at Le Mans until 1994. But, that was a different Bugatti. World War II ended the company’s proud run of building some of the finest automobiles in the world. 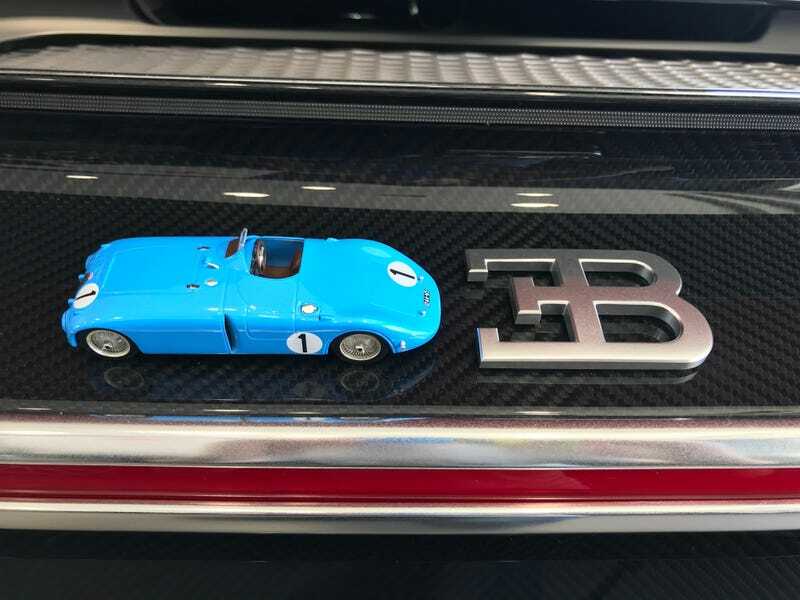 In a tragic postscript to the ‘39 Le Mans, Jean Bugatti took the 57C out a few weeks after the race for a test run up the Molsheim-Strasburg road. A drunken bicyclist caused him to swerve and crash into the trees where Jean was killed at the age of 30. His father would die of a lung infection in 1947 shortly after his property in Alsace had been returned to him following its confiscation right after the liberation. This is a lovely 1/43 by IXO. It’s got excellent details like those piano wire wheels. It also rolls well, which is always important to me. It’s a car, it should roll. I don’t think models with fixed wheels should count as actual cars. Anyway, this one also feels really solidly put together. The color is great. The shape and scale are quite accurate, I think. I also like the straight pipe on the bottom. This car isn’t quite as well known as the 1937 Bugatti (which Jobjoris profiled in an excellent post 2 years ago). Probably owing to the fact that it doesn’t exist any more, and the ‘37 57G is on display in Philadelphia and gets shown and run every so often. But this, being the last of the great Bugattis, is one of the most historically significant French cars ever built in my opinion. German occupation was right around the corner, and many French could see it coming. But, with this car and win, they let the world know they weren’t rolling over without a fight. And the two guys behind its wheel were ready to lead the charge.